Titus has taken an interest in baking, and out of nowhere, he declared that we were going to make muffins. He did this late at night, so I promised him he could bake some the next day. I asked what kind, and he confidently replied: "Raisin muffins!" Now, I'm not a huge raisin fan, nor is he actually, but I wanted him to be in charge, so raisin, sure. I sneakily got him to agree to add some chocolate chips, too, but feel free to do all raisin. Or all chocolate. The brown butter was part mishap, part intention. And all good. Beat eggs and sugar until thick and very fluffy. Melt the butter and let it cook on high heat until it's turning golden brown and gorgeously fragrant. Add to the eggs, along with the milk and cream. Add baking powder and flour and stir everything together. Finally add the raisins and chocolate. 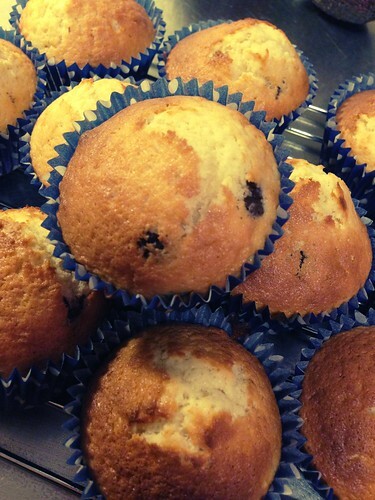 Fill muffin cases about 3/4 full, and bake at 200°C for about 10-12 minutes. I hope he liked his creations! They look very nice. How did you get your raisins to "float"? Mines usually tend to sink, even if I coat them in flour. Rit - I didn't do anything special. Most of them did cluster towards the bottom though, but they were fairly well dispersed.